Live as always at 20:00. On 24 May, Ukrainian law enforcers held a sweeping special operation in 15 regions to detain former top tax officials. Interior Minister Arsen Avakov described it as the largest anti-corruption operation in the history of Ukraine. It involved 1,700 police officers and 500 military prosecutors. The detainees were delivered to Kyiv by helicopters. How Ukrainian security forces worked in the best traditions of Western special services, was the anti-corruption blockbuster timed to coincide to the report of the Prosecutor-General Yuriy Lutsenko at the Verkhovna Rada, will the murder of Sheremet will be ever solved, and on the current reform of the security agency. 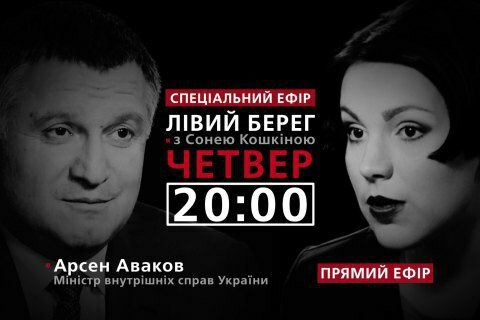 On these and many other things, the head of the Interior Ministry Arsen Avakov will talk today at 20:00 on Sonya Koshkina's tough talk show Left bank on Channel 24.